The AUV, which was acquired by Westward Region Commercial Fisheries Finfish Research with Pacific Coast Salmon Recovery Funds in February 2009, has provided comprehensive, high-resolution ecological profiles of Kodiak and Alaska Peninsula lakes in an effort to modernize and streamline our sampling methods and improve our understanding of the conditions that affect salmon populations. Use of the AUV also enables us to update bathymetric maps from the 1960s and explore lake productivity models. 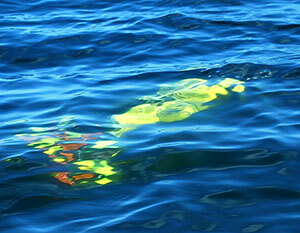 The AUV cruising at a depth of 1 meter. Weighing only 45 lbs, she is easily transported to her launch points and retrieved from her final destinations. Missions are first plotted on a geo-referenced image and then loaded onto the AUVâ€™s onboard computer via its own wireless network. Missions can be safely run for 5 hours at a cruising speed of 2.5 knots. The antenna on top of the AUV houses a GPS unit that guides the AUV on its plotted course as long as she is not submerged underwater. On diving missions, which can reach depths as great as 200 feet, the AUV follows a compass heading to the next waypoint. 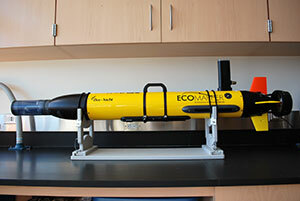 Depth, temperature, dissolved oxygen, pH, chlorophyll, turbidity, and conductivity data are collected every second while the AUV sails on her mission. Various depth, gain, and frequency settings may be programmed for scanning sonar images. Upon completion of a mission, all data are easily downloaded over the same wireless network. 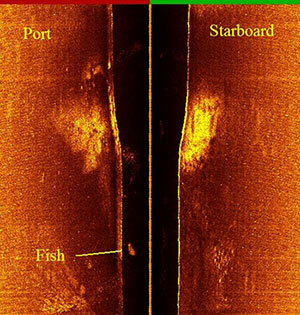 Sonar image from Karluk Lake showing the scan from the port and starboard sides of the AUV.